Will Gold Be a Medium of Exchange Again? While gold is widely held as a store of purchasing power, and while it is possible to use gold as a unit of account (by converting its floating value to denominate anything in gold terms), gold is no longer widely used as a medium of exchange. In the days when people carried around gold doubloons and whatnot as money, you had a global political system characterized by pockets of stability (the Spanish Empire, or the Chinese Empire, or whatever) scattered among large areas of anarchy. Those stable centers minted and gave out the gold coins. But in the event of a massive modern global catastrophe that brought widespread anarchy, the gold bars buried in your backyard would not be swappable for eggs or butter at the corner store. You’d need some big organization to turn the gold bars into coins of standard weights and purity. And that big organization is not going to do that for you as a free service. More likely, that big organization will simply kill you and take your gold bars, Dungeons and Dragons style. In other words, I think gold is never coming back as a medium of exchange, under any circumstances. It is no more likely than a return of the Holy Roman Empire. Say goodbye forever to gold money. Well, forever is a very long time. Human history stretches back just six million years. Recorded history suggests that gold has only been used as a medium of exchange for five or six thousand years. But for that tiny sliver of human history, gold became for many cultures entirely synonymous with money, and largely synonymous with wealth. So I think Noah is over egging his case by using the word forever. Societies have drastically changed in the last six thousand years, let alone the last one hundred. We don’t know how human culture and technology and societies will progress in the future. As humans colonise space, we may see a great deal of cultural and social fragmentation; deeper into the future, believers in gold as money may set up their own planetary colonies or space stations. But what about the near future? Well, central banks are still using gold as a reserve. In the medium term, it is a hedge against the counter-party risks of a global fiat reserve system in flux. But central banks buying and acquiring gold is not the same thing as gold being used as a medium of exchange. Gold as a reserve never went away, and even in the most Keynesian of futures may not fully die for a long time yet. And what about this great hypothetical scenario that many are obsessed with where the fragile interconnective structure of modern society — including electronics — briefly or not-so-briefly collapses? Such an event could result from a natural disaster like a megatsunami, or extreme climate change, or a solar flare, or from a global war. Well, again, we can’t really say what will or won’t be useful as a medium of exchange under such circumstances. My intuition is that we would experience massive decentralisation, and trade would be conducted predominantly either in terms of barter and theft. If you have gold coins or bars, and want to engage in trade using them — and have a means to protect yourself from theft, like guns and ammunition — then it is foreseeable that these could be bartered. But so too could whiskey, cigarettes, beer, canned food, fuel, water, IOUs and indeed state fiat currencies. If any dominant media of exchange emerges, it is likely to be localised and ad hoc. In the longer run, if modern civilisation does not return swiftly but instead has to be rebuilt from the ground up over generations then it is foreseeable that physical gold (and other precious metals, including silver) could emerge as the de facto medium of exchange, simply because such things are nonperishable, fungible, and relatively difficult to fake. On the other hand, if modern civilisation is swiftly rebuilt, then it is much more foreseeable that precious metal-based media of exchange will not have the time to get off the ground on anything more than the most localised and ad hoc of bases. So when does gold actually pay off? Well, remember that stories do not have to be true for people to believe them. Lots and lots of people believe that gold or gold-backed money in the event of a global social disruption. And so when this story becomes more popular (possibly with the launching of websites like Zero Hedge? ), or when large-scale social disruption seems more likely while holding the popularity of the story constant, gold pays off. Gold is like a credit default swap backed by an insolvent counterparty – it has no hope of actually being redeemed, but you can keep it around forever, and it goes up in price whenever people get scared. In other words, gold pays off when there is an outbreak of goldbug-ism. Gold is a bet that there will be more goldbugs in the future than there are now. And since the “gold will be money again” story is very deep and powerful, based as it is on thousands of years of (no longer applicable) historical experience, it is highly likely that goldbug-ism will break out again someday. So if you’re the gambling type, or if you plan to start the next Zero Hedge, or if your income for some reason goes down when goldbug-ism breaks out, well, go ahead and place a one-way bet on gold. Noah, of course, is right that gold is valuable when other people are willing to pay for it. The reason why gold became money in the first place was because people chose to use it as a medium of exchange. They liked it, and they used it, and that created demand for it. If that happens again, then gold will be an in-demand medium of exchange again. But for many reasons — including that governments want monetary flexibility — most of the world today has rejected gold as a medium of exchange. But there is another pathway for gold to pay off. Noah is overlooking the small possibility that gold may at some point become more than a speculative investment based on the future possibility that gold may at some point return as a monetary media. In 2010, scientists from the Brookhaven National Laboratory on Long Island, using their Relativistic Heavy Ion Collider (RHIC) collided some gold nuclei, traveling at 99.999% of the speed of light. The plasma that resulted was so energetic that a tiny cube of it with sides measuring about a quarter of the width of a human hair would contain enough energy to power the entire United States for a year. So there exists a possibility that gold could be used at some date in the future as an energy source — completely obliterating any possibility of gold becoming a medium of exchange again. Of course, capturing and storing that energy is another matter entirely, and may prove impossible. In that case — if gold does not become a valuable energy source — it is almost inevitable that some society somewhere at some stage will experiment again with gold as a medium of exchange. What Are Interest Rates And Can They Be Artificially Low Or High? Many economic commentators believe that interest rates in America and around the world are “artificially low”. Indeed, I too have used the term in the past to refer to the condition in Europe that saw interest rates across the member states converge to a uniformly low level at the introduction of the Euro, only to diverge and soar in the periphery during the ongoing crisis. So what is an interest rate? An interest rate is the cost of money now. As Eugen von Böhm-Bawerk noted, interest rates result from people valuing money in the present more highly than money in the future. If a business is starting out, and has insufficient capital to carry out its plans it will seek investment, either through selling equity in the ownership of the business, or through credit from lenders. For a lender, an interest rate is their profit for giving up the spending power of their capital to another who desires it now, attached to the risk that the borrower will default. In monetary economies, money tends to be distributed relatively scarcely. In a commodity-based monetary system, the level of scarcity is determined by the physical limits of how much of a commodity can be pulled out of the ground. In a fiat-based monetary system, there is no such natural scarcity, but money’s relative scarcity is controlled by the banking system and central bank that lends it into the economy. If money was distributed infinitely widely and freely, there would be no such thing as an interest rate as there would be no cost to obtaining money now, just as there is no cost to obtaining a widely-distributed and freely-available commodity like air (at least on the face of the Earth!). Without scarcity money would lose its usability as a currency, as there is no incentive to trade for a substance which is uniformly and effectively infinitely available to everyone. So an interest rate is not only the cost of money, but also a symptom of its scarcity (and, as Keynes pointed out, a key mechanism through which rentiers profit). So, where does the idea that interest rates can be made artificially low or artificially high arise from? There is a certain rate of interest on loans which is neutral in respect to commodity prices, and tends neither to raise nor to lower them. This is easy to define and hard to calculate. It is whatever interest rate yields a zero-percent inflationary level. Because interest rates have a nonlinear relationship with inflation, it is difficult to say precisely what the natural interest rate is at any given time, but Wicksell’s definition specifies that a positive inflation rate means the market rate is above the natural rate, and a negative inflation rate means the market is below the natural rate. (Interestingly, it should be noted that the historical Federal Funds Rate comes pretty close to loosely approximating the historical difference between 0 and the CPI rate, despite questions of whether the CPI really reflects the true price level due to not including housing and equity markets which often record much greater gains or greater losses than consumer prices). 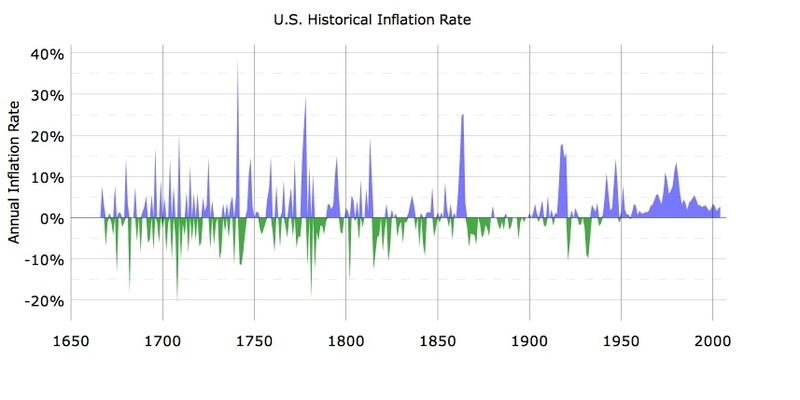 The notion of a natural rate of interest is interesting and helpful — certainly, high levels of inflation can be challenged through decreasing interest rates (or more generally increasing credit-availability), and deflation can be challenged by decreasing interest rates (or more generally increasing credit availability). If the goal of monetary policy is price stability, then the notion of a “natural interest rate” as a guide for monetary policy is useful. But policies of macrostabilisation have been strongly questioned by the work of Hyman Minsky, which posited the idea that stability is itself destabilising, because it leads to overconfidence which itself results in malinvestment and credit and price bubbles. Austrian Business Cycle Theory (ABCT) developed by Ludwig von Mises and Friedrich Hayek, most influentially in Mises’ 1912 work The Theory of Money and Credit, theorises that the business cycle is caused by credit expansion (often fuelled by excessively low interest rates) which pours into unsustainable projects. The end of this credit expansion (as a result of a collapse resulting from excessive leverage, or from the failure of unsustainable projects, or from general overproduction, or for some other reason) results in a panic and bust. According to ABCT, the underlying issue is that the banking system made money cheaply available, and the market rate of interest falls beneath the natural rate of interest, manifesting as price inflation. I do not dispute the idea that bubbles tend to coincide with credit expansion and easy lending. But it is tough to say whether credit expansion is a consequence or a cause of the bubble. What is the necessary precursor of an unsustainable credit expansion? Overconfidence, and the idea that prices will just keep going up when sooner or later the credit expansion will run out steam. This could be the overconfidence of central bankers, who believe that macrostabilisation policies have produced a “Great Moderation”, or the overconfidence of traders who hope to get rich quick, or the overconfidence of homeowners who see rising home prices as an easy opportunity to remortgage and consume more, or the overconfidence of private banks who hope to make bumper gains on loans or loan-related securities (Carl Menger noted that fractional reserve banking and credit-fuelled bubbles originated in economies with no central bank, in contradiction of those ABCT-advocates who go so far as to say that without central banking there would be no business cycle at all). And is price stability really “natural”? Wicksell (and other advocates of a “natural rate of interest” like RBCT and certain Austrians) seem to imply so. But why should it be the norm that prices are stable? In competitive markets — like modern day high-tech markets — the tendency may be toward deflation rather than stability, as improving technology lowers manufacturing costs, and firms lower prices to stay competitive with each other. Or in markets for scarce goods — like commodities of which there exists a limited quantity — the tendency may be toward inflation, as producers may have to spend more to extract difficult-to-extract resources form the ground. Ultimately, human action in market activity is unpredictable and determined by the subjective preferences of all market participants, and this applies as much to the market for money as it does for any market. There is no reason to believe that prices tend toward stability, and the empirical record shows a significant level of variation in price levels under both the gold standard and the modern fiat system. Ultimately, if interest rates are the cost of money, and in a fiat monetary system the quantity and availability of money is determined by lending institutions and the central bank, how can any interest rate not be artificial (i.e. an expression of the subjective opinions, forecasts and plans of those involved in determining the availability of credit and money including governments and central bankers)? Even under a commodity-money system, the availability of money is still determined by the lending system, as well as the miners who pull the monetary commodity or commodities out of the ground (and any legal tender laws that define money, for example monetising gold and demonetising silver). And if all interest rates in contemporary markets are to some degree artificial this raises some difficult questions, because it means that the availability of capital, and thus the profitability (or unprofitability) of rentiers are effectively policy choices of the state (or the central bank).